Before the rush of the holidays set in, take a weekend to slow down, find your center, and experience the joy available in all seasons. 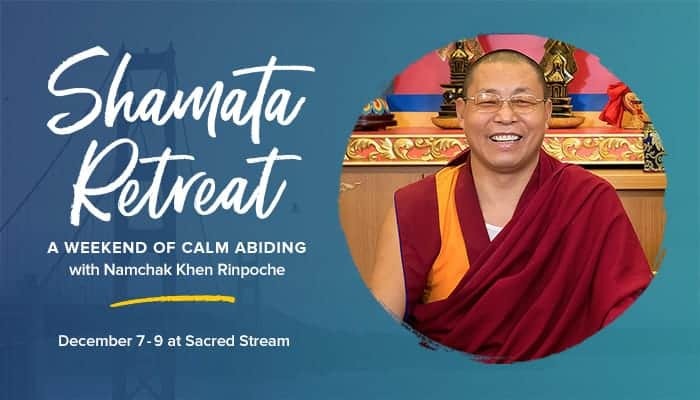 Join Tibetan master teacher and scholar Namchak Khen Rinpoche for an intimate weekend meditation retreat focused on the foundational practice of Calm Abiding meditation, or Shamata. The Shamata retreat will be a blend of teaching and practice with the aim of cultivating more calm and center in your life. In his profound yet humorous style, Khen Rinpoche will teach you how to build the backbone of your meditation practice and provide tangible ways to embody compassion, joy, and courage so you show up as your best self at work, home, and in relationships. This retreat is perfect for beginner and experienced meditators alike! Khen Rinpoche completed the study of all the Indian Buddhist philosophical traditions and the Nyingma School of Tibetan Buddhism under numerous master teachers. He also completed an additional nine years of rigorous training and served at the Namdroling monastery for several years. Enthroned as Khenpo by HH Penor Rinpoche, he taught at the Shedras of Ringo Tulku and Shechen Monastery for many years. Khen Rinpoche strictly abides by his precepts in everyday life and is diligent in his practice. He visits and teaches around the world, including the Namchak Foundation and the Namchak Retreat Ranch in Montana, as well as in Taiwan, Hong Kong, and other locations. While in the U.S., he resides and meditates at the Garden of One Thousand Buddhas in Arlee, Montana. Our intention is to make this workshop accessible to all. If the program costs present a financial barrier, please contact jessica@namchak.org. • Work-study positions are also available. Stipends to help offset the cost of childcare are also available. Please contact jessica@namchak.org for more information. Beverages and snacks will be provided, lunches will be on your own. There will be ample time to leave the retreat to eat lunch nearby.